This is an incredibly simple dessert to make, and there's no kid or adult who won't absolutely love it. This pie can be made with one to eight layers, and you can have as many different flavors as you'd like, too. The more layers and colors, the more exciting it is to serve. And eat! Be prepared to fight for the crust – it's amazing! Set the two pints of ice cream out to soften while you make the crust. 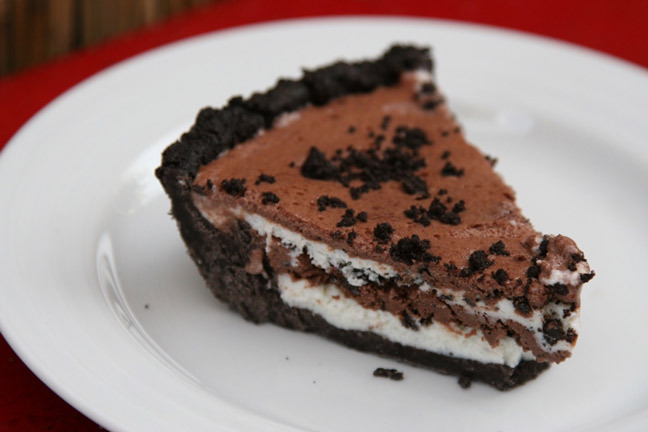 To make the crust, use a food processor to finely grind the Oreos. This should take about 30 seconds, and the result should be pretty smooth. Pour the ground Oreos into a large mixing bowl and fold in the melted butter. Remove 1/4 cup of this mixture and set it aside. Pour the remaining mixture into a pie plate and, using your hands, gently press to evenly coat the inside of the pie plate to form the crust. Put the plate in the freezer until firm, about 5 minutes. Spread an even layer of the vanilla ice cream into the crust and sprinkle with about a tablespoon of the reserved Oreo mixture. Freeze until firm. Repeat this process three more times, ending with chocolate for the top (fourth) layer.